You wanna know what’s really difficult about a vegan lifestyle? Finding decent vegan shoes, is my answer. I want a shoe that looks good, is affordable, doesn’t fall apart after two weeks, and is ethically made. Until recently it was very difficult for me to find footwear which did fit all those criteria. Sure, there are lots of companies selling vegan shoes. But usually those are too expensive for me or I don’t like the model. Or both. In the past I had to make a lot of compromises when it came to shoes. Often these compromises were bad. (I bought shoes that were vegan but not ethically produced, for example.) Last year when I spent another evening searching the internet for new shoe models, I stumbled across Will’s Vegan Shoes, a UK based company, that sells both shoes and accessories, such as belts and wallets. I hardly could believe my eyes when I browsed their website because not only did I like the majority of their models, they also weren’t too expensive for me. Another great thing is that they ship worldwide and you can return and exchange their shoes for free. The main materials used for these shoes are breathable and water resistant microfibres. Last winter I found some great knee lenght boots that I had to return after only a couple of months. They started to break apart. (I bought them from a large retail company, I am pretty sure they were not ethically produced and considering their poor quality, they turned out way too expensive.) I was disappointed and sure I could never replace them. But I was wrong. And I cannot tell you how happy I am about this. These brown boots shown above are exactly what I was looking for! 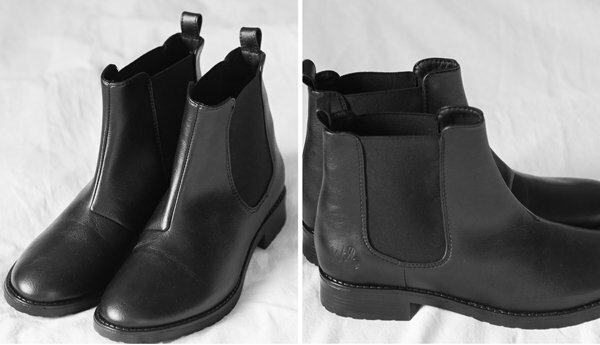 When it comes to shape and cut, they are very similar to my Chelsea boots. But instead of side gussets, they have a zipper and an adjustable strap at the the calves. Even though I have the same thick sock problem with them they do fit my calves, which is not a given. Often I cannot squeeze my legs into knee lenght boots. So I am really exited about these shoes. The third pair I got were black heeled shoes, also shown above. I hardly wear heeled shoes and if I do, I won’t last long. If you see someone hobbling and jumping on the sidewalk, that’s usually me wearing heels. But not in these shoes. They are very comfortable and have an extra soft and quite thick insole that feels like a cushion. The heel itself is quite broad and supportive. I also think the large zipper on the side is a nice detail. 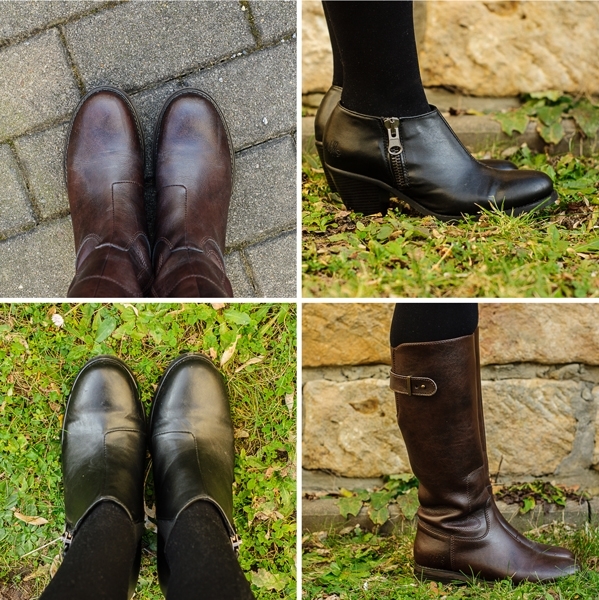 My review is a bit late (I wanted to actually try these shoes out and wear them a couple of times) and both the heeled shoes and the knee length boots are sold out right now in most sizes, but the company has many new models in stock, which you should check out! I am very pleased with the look and the quality of my choices and they have a good price. (I think paying about 90 – 100 € for a pair of vegan shoes made in the EU is pretty fair.) I had intended to keep two out of three pair. But in the end I kept them all because I think they will last a while. I don’t like to buy new stuff each season, I rather have good quality items that last more than one summer, and I think these shoes fit the bill, but I’ll keep you updated. Since I had them shipped to Germany from the UK, I paid 11.48 € for shipping (the fee seems to be dependent on how much your order weighs) but got a 3.82 € discount, because shipping for the first item was free. (I subscribed to their newsletter and got a voucher.) I purchased all of these shoes with my own money and was not paid or compensated by Will’s Vegan Shoes in any way to write this review. I wrote it because I like their products and think this company is worth supporting. Update April 2016: So far the shoes survived two winters and they are still good! Thank you for posting this review, I’ve been meaning to buy a pair from Will’s but wasn’t sure about buying shoes online, I’ll will do so now. Do you find these shoes are true to size? Thank you ! Hi Karley! In my opinion yes! I love these boots! I’ve been considering purchasing them myself a for a few days now. Do you find that they keep your feet warm? My feet are always freezing and I’d love to not have to triple up on socks this winter haha. MIHL, thanks. I actually haven’t been able to find anything on their website that indicates any retail outlets, which may very well be because they don’t sell through any. So I just figured I’d see if you had run across anything. Thanks for the response, appreciate it. After I answered your question I remembered that you can actually purchase these in Germany. There is a vegan shoe store (AVESU) in Berlin, where you can try them on. This isn’t really helpful to you but maybe you can contact them directly and ask about UK retailers. Do you know if they sell through any retail outlets, or is it only online? If it’s possible, I’d like to try them on before I buy. I have to order them online because I live in Germany. I don’t know about the UK but I am sure you can find out through their website. Still going strong! Very good quality. Found Will’s shoes by going to vegan fair’s and so pleased with them. It is so hard to buy well made shoes if your a vegan or just don’t want to wear leather shoes. Also a great service, when we have been told that a item is to arrive it always turns up on the right day. Thank you. That’s great to hear! Thank you for letting me know. Viiiiiielen lieben Dank für Deinen Bericht! Ich finde es schrecklich schwer, ansehnliche Schuhe ohne Leder zu finden, und bin total froh um Deine Empfehlung – und ich finde es super, dass Du erst geschrieben hast, nachdem Du die Schuhe auch wirklich eine Zeitlang getragen hattest! Mir geht es wohl ähnlich, sobald ein Paar kaputt geht, krieg ich gleich die totale Panik, dass ich nie wieder Schuhe finden werde! ;-) Bin total begeistert von Deinem Blog und werde jetzt noch eine Weile stöbern – danke! I know what you mean, finding shoes can be the bane of my existence! Particularly with my size 11 (US) foot. We have a vegan shoe shop here that makes some nice styles, and two pairs of shoes from them which I love (and they can make to your foot) however they are very expensive. It’s great that this company does worldwide shipping – I will have to check out how much it would cost – there are some nice shoes there and they even appear to carry my size! Thanks for sharing! Toll sehen sie aus! Vielen dank fuer diese nuetzliche Rezension! Ich muss auch sagen, dass ich es sehr erfrischend finde, dass du bei deinem Deutsch sehr wenige englische Woerter benutzt. :) So viele Blogger (da, schau mal), wuerden anstatt Rezension “review” sagen! Ha, danke! Du hast mich darauf gebracht, das Rezension eigentlich das total falsche Wort hier ist. Ist ja kein Buch. Da habe ich direkt aus dem Englischen übersetzt, ohne nachzudenken. Wird sofort geändert. Thanks Mihl! I haven’t heard of this brand before – they look lovely! I recently bought my first pair of Will’s because I needed some decent shoes for work. I usually wear trainers, but I can’t really wear those to the office, and I’ve gotten sick of buying cheap shoes that happen to be vegan because of their poor quality. I decided to buy some of Will’s, and I can honestly say I’ll never go back. All my ‘proper’ shoes will now come from the brand! Yeah, I think they have great office options. That was a thing that annoyed me before. I could never find proper shoes for these occasions. I used to live in London, was present when they launched their products, and I have been buying only shoes from this brand since I discovered it! I also love their shoes, they have a great cut and amazing quality. I am so pleased with them! My husband just ordered another pair yesterday actually! I think the owner is actually also behind the brand “Vegatarian shoes”, but I find the design of Will’s is so much better! Yes, I have to add that they have an amazing range of men’s shoes, too!